*This is a continuation of a previous article which can be found here. The next morning I naturally woke up around 7am. The tent was chilly and I could hear rain lightly tapping against the rainfly. Today’s forecast had a 65% chance of rain and only called for light, intermittent rain until the early evening. I rolled over and went back to sleep, opting to wait out the early morning rain rather than try to get an earlier start on the trail. At around 9:45 am the rain eased up and I could just hear drops falling from the trees above us. I waited for most of it to stop before waking Kevin. 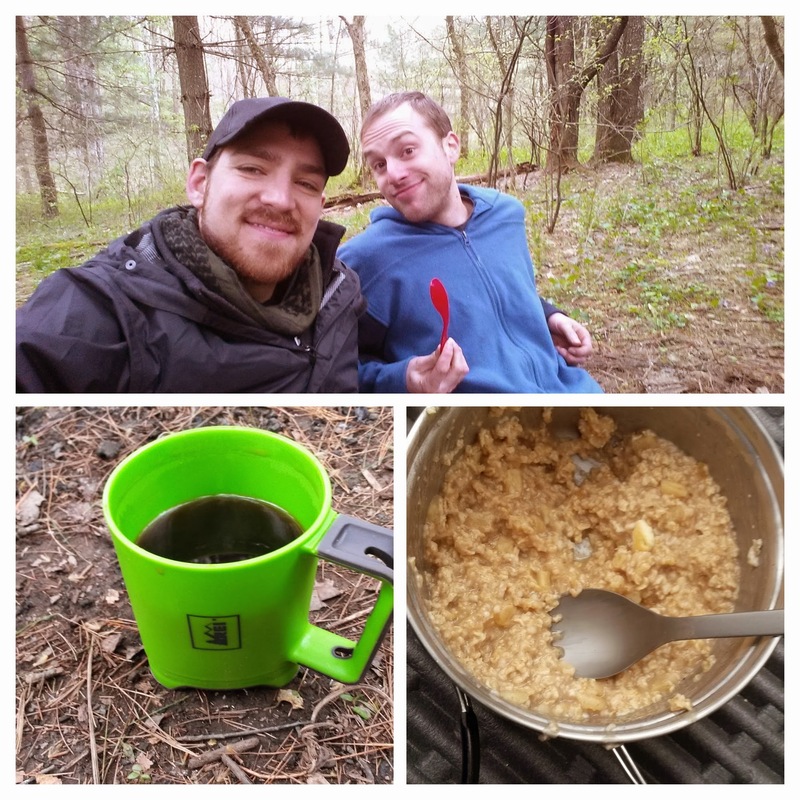 We made a delicious breakfast of instant oatmeal and Poptarts © complete with hot coffee. True to my style of always carrying too much gear, I had a backpacker’s French Press coffee maker with me. The delicious coffee was worth it. We had a pretty leisurely breakfast and then decided to break camp. Kevin cleaned up the breakfast dishes while I cleaned up camp and starting packing up our gear. 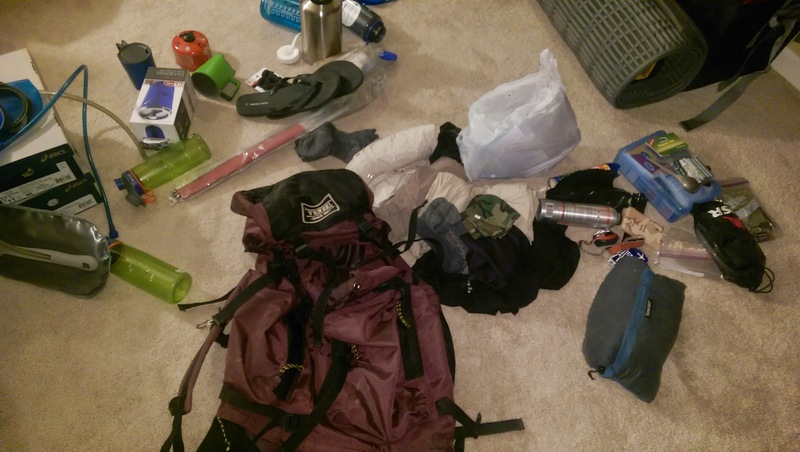 We disassembled the tent and finished packing all of our gear. The temperature was still only in the upper 30s. So we had on most of our warmer gear. 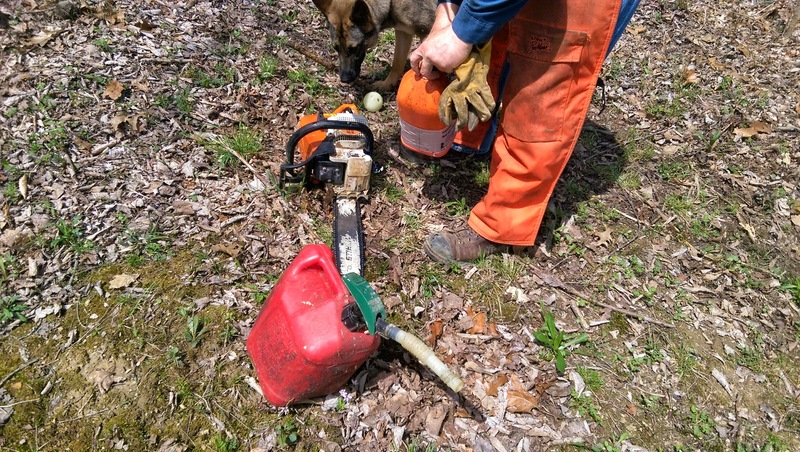 This freed up a lot of space in our packs. 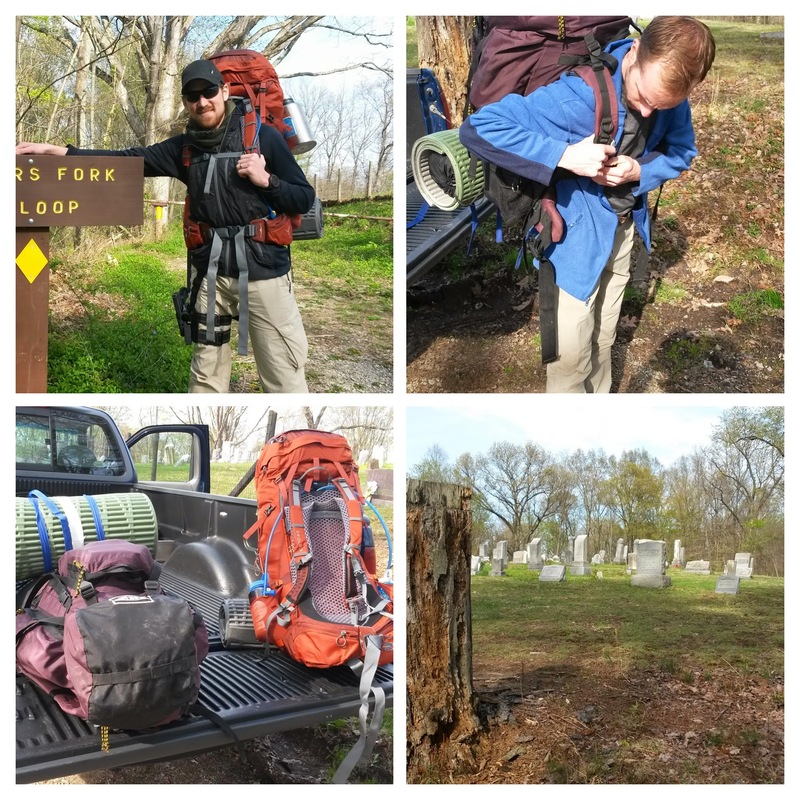 It wasn’t until almost noon that we finally got on the trail (one of the latest starts I’ve ever had on a backpacking trip). I wasn’t concerned though, since we only had about 10 miles of hiking to do today and we didn’t need to leave until Sunday. For this being his first trip, Kevin continued to surprise me with his quick pace, especially with his large pack on. 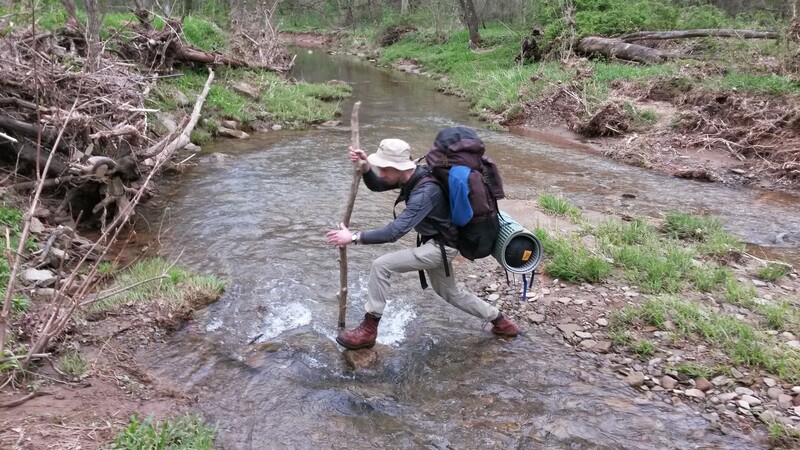 Soon we reached Archer’s Fork Creek and needed to cross. The frequent rain had caused the water level to average between two and three feet deep and it was about fourteen feet wide. I found a small island and hopped out to it. 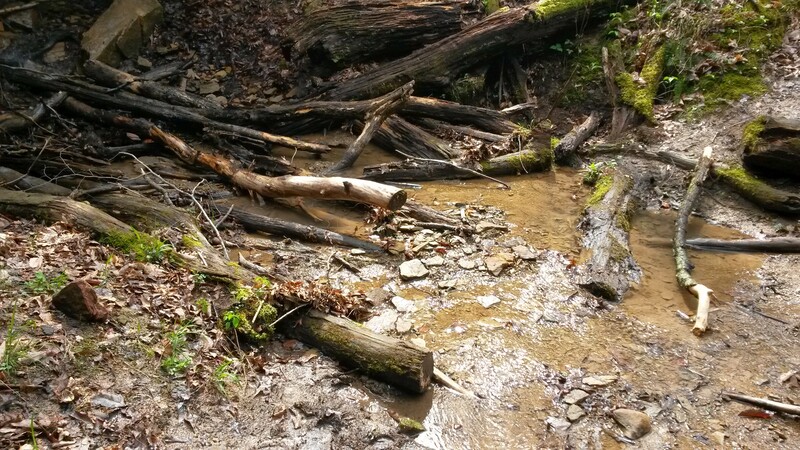 From there, I was able to walk through a couple shallow points and utilize some larger rocks to help me get across. Kevin didn’t trust the waterproofing on his boots quite as much as I did. So he spent some time traveling up and down the creek looking for a place to cross. Meanwhile, I sat on the other side of the creek and relaxed while I snapped pictures of the creek and Kevin’s dilemma. We lost a bit of time with this creek crossing, but still weren’t concerned. Finally, he was convinced that I had found the best place to cross. I tossed him a large stick that I had found to help him vault from the island to the other side. Once he made it across, we had to backtrack along the creek to find the trail again. 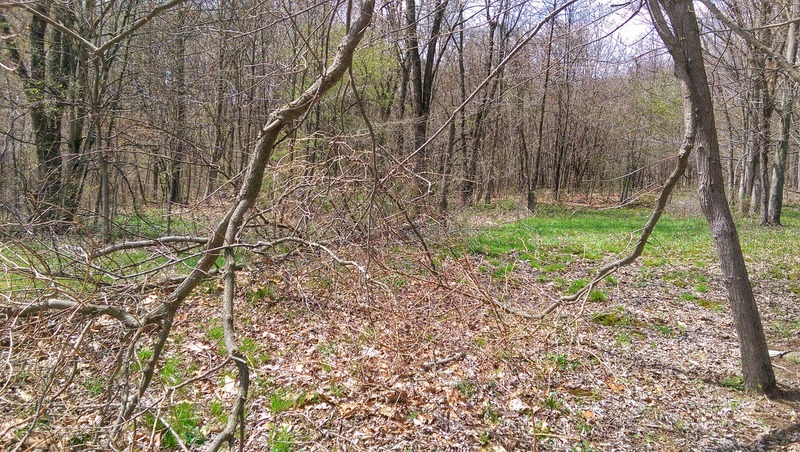 We located the blazes after fighting our way through a thicket of thorn bushes. The trail quickly climbed from the lowest point on the trail to almost the highest. It was about a 500 foot climb and we had to take a few breaks on the way up. 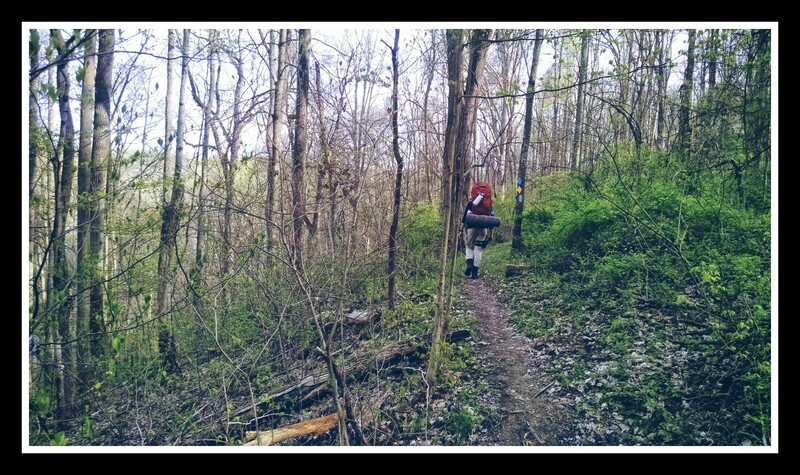 Of course I claimed that it was to take pictures, but my quads were on fire and my fifty pound pack felt like a hundred. We made it to the top of the hill and thankfully, the trail leveled out for a bit. Kevin opened a bag of beef jerky and we enjoyed it as we walked along a wider than usual path side-by-side. Our discussion turned to growing up and how we both had similar backgrounds as very hyper children. The path soon turned and headed back down into the woods. Just about this time a light rain started. 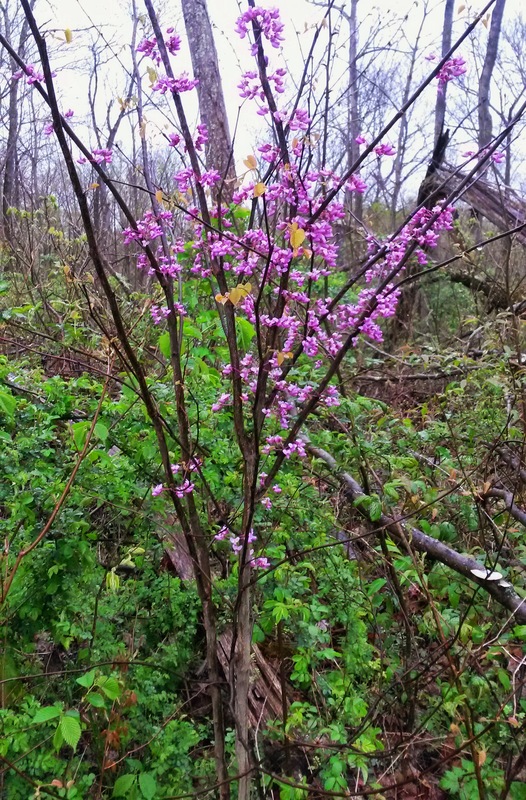 We decided to press on without stopping to put on rain gear since the trees now mostly protected us from the rain. Once we reached the bottom of the hill that we had just struggled to climb, we found a nice camping spot and decided to stop for lunch. We sat under some pine trees and feasted on the most amazing tuna and crackers we had ever tasted (everything tastes better on the trail). At this camp site, we took the time to put our rain covers over our bags and don our rain jackets. The rain didn’t look like it was letting up so we wanted to be prepared. With the temperature in the low 40s, getting wet could quickly mean hypothermia. The path quickly took us back into an uphill climb as the rain continued to come down. It grew in strength and there didn’t seem to be an end in sight (so much for light, intermittent showers). 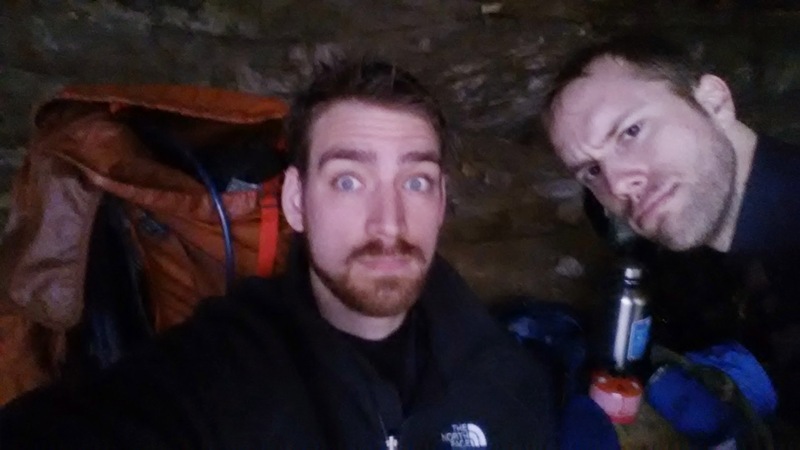 We trudged on through the rain in steep elevation. 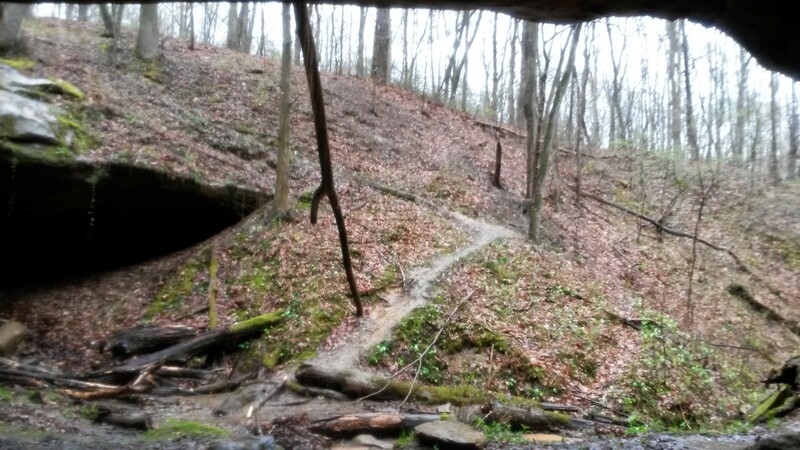 The rain made the paths muddy and slippery. It also sapped our strength, but even so, there were still some great sights to see and we kept our spirits high. 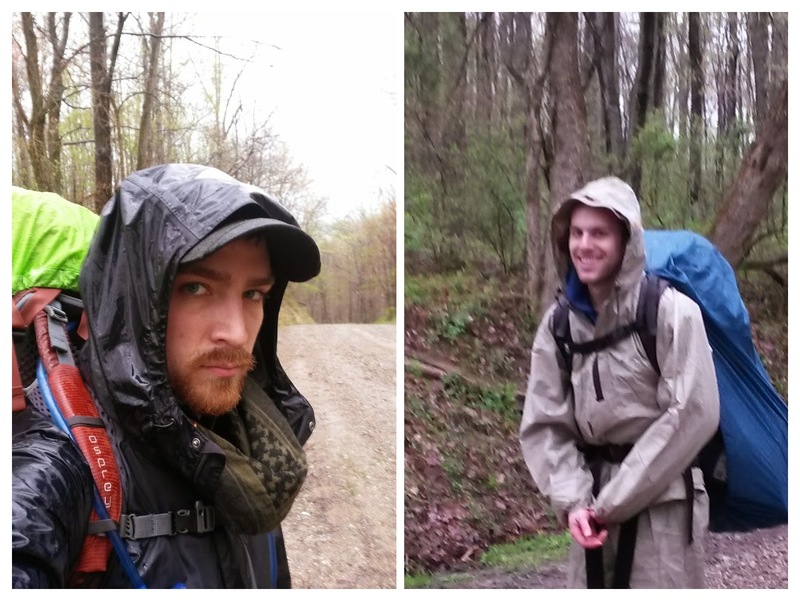 Although, the weather was still cold, our added rain gear and constant movement caused us to sweat. Rain continued to come down and soon we were completely soaked. The trail continued with multiple PUDs (Pointless Ups and Downs) leaving us completely exhausted. We had been on the trail for about three hours since lunch and the rain still had no end in sight. We stopped to refill some of our water bottles from a creek for dinner. If we ever found a good campsite, we would want hot meals. An hour later found us at the top of yet another peak huffing and puffing for air while every inch of our body was saturated by a combination of rain and sweat. I was wearing premium rain gear, but even it could not stand up to the hours of steady wetness. 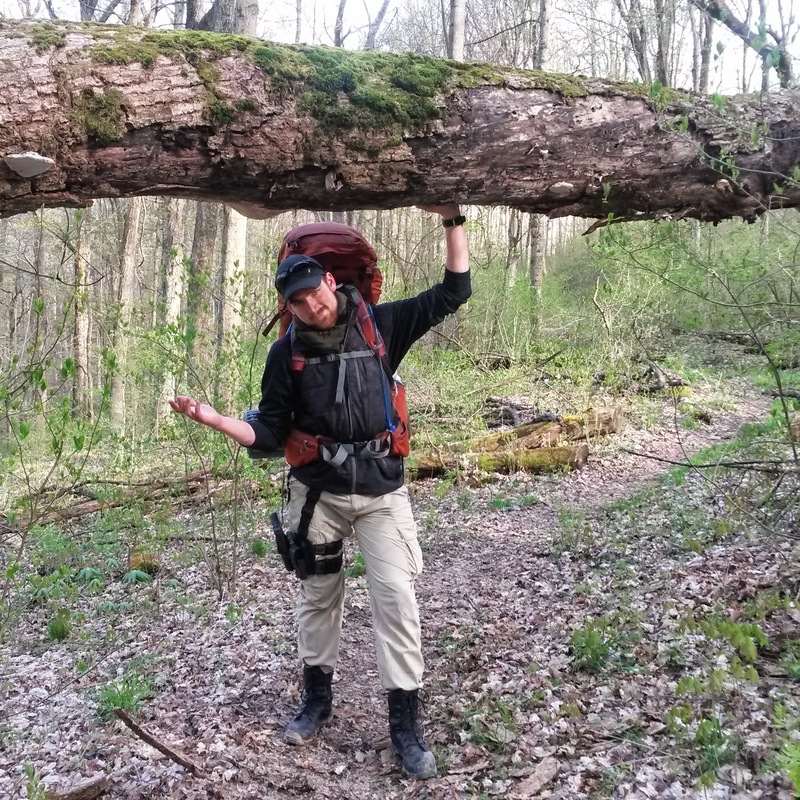 Our bodies cried out for rest and we both collapsed on a log without taking our packs off. 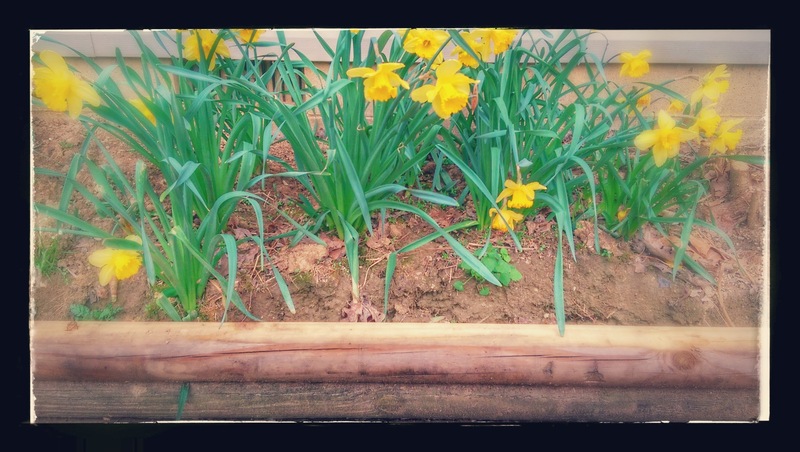 Kevin leaned forward onto his hands and promptly fell asleep despite the continued rain. I stared at my soaked, pruny fingers and wanted nothing more than a towel to dry them off with. I leaned back against my pack for support and let the rain fall against my face. My mind pondered the events that had led us here and everything we had been through. Never had I been so completely saturated on a backpacking trip and I silently wondered if Kevin was regretting being talked into this. Despite the conditions, I had no regrets (except maybe not upgrading my rain gear). I was happy in the moment with nothing else on my mind. 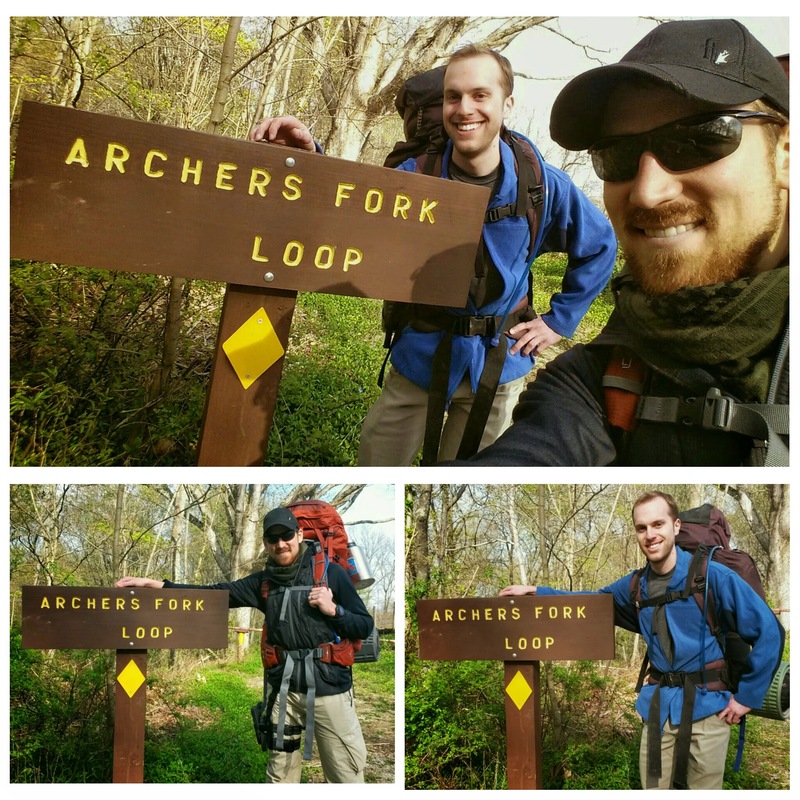 Archer’s Fork Trail is a beautiful and moderately challenging loop trail in Southeastern Ohio, deep within Wayne National Forest. 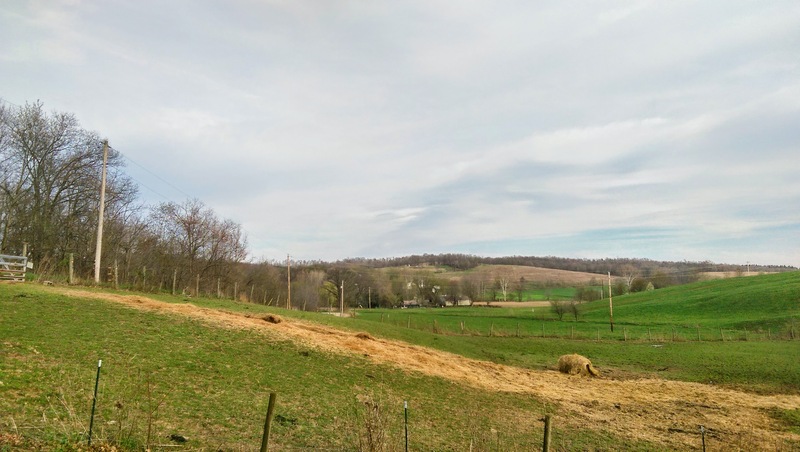 It is located near the Ohio River and the West Virginia border in between Marietta, Ohio and Wheeling, West Virginia. 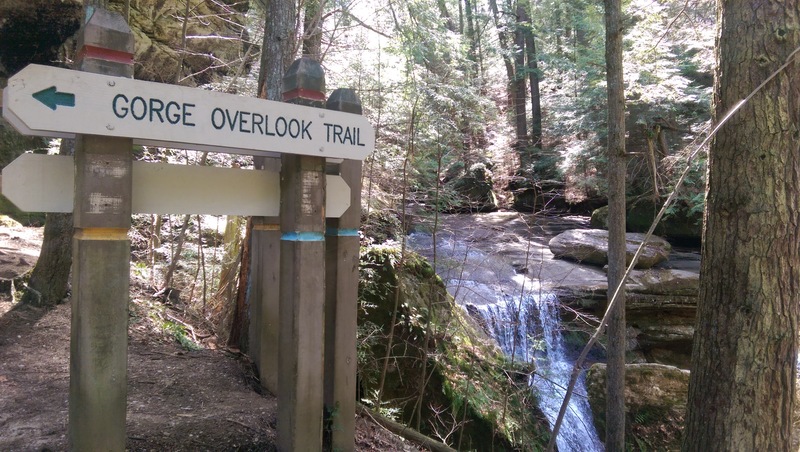 The challenge of the trail comes in the elevation change, which is somewhat unusual for Ohio trails. This is due to the trail being near the Appalachian Mountains. Elevation on the trail ranges from around 700 feet to about 1,200 feet. These elevation changes occur frequently taking adventurers from river beds to high hilltops and back again. 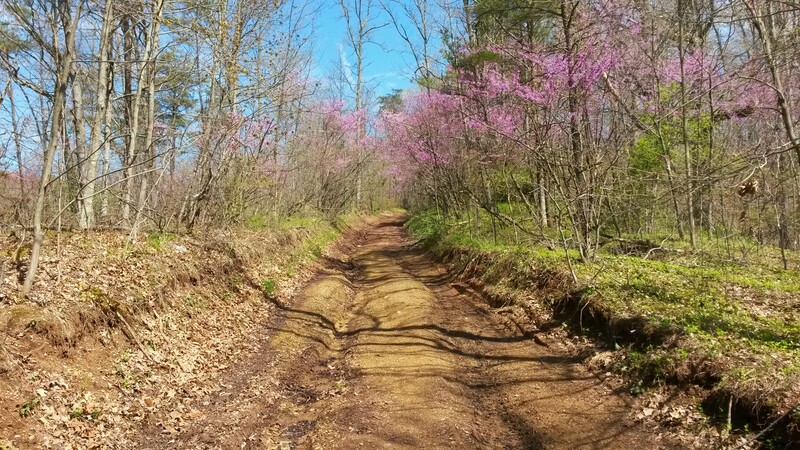 The trail itself is between 11 and 12 miles, but has many side trails and sites to see that can extend the trip. 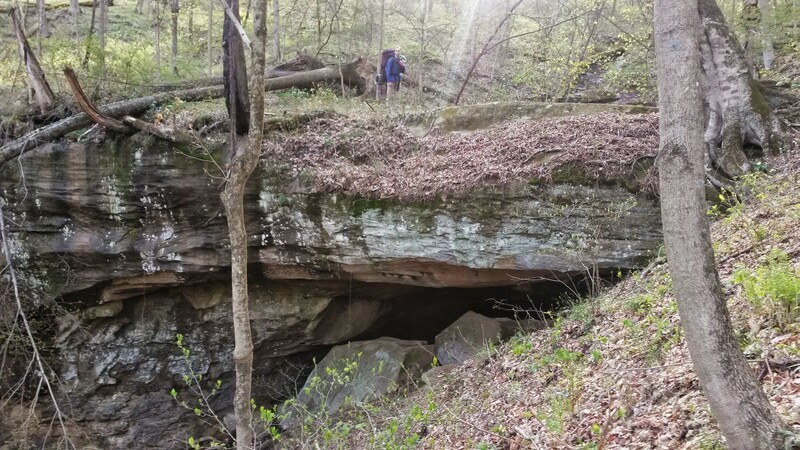 These include a Covered Bridge Trail and connectors to the North Country Trail as well as a small diversions to see the Natural Bridge and the Great Cave. The trailhead is located near a small, well-kept cemetery at the top of a hill. It was about 5:30 pm when we set out on the trail for the day and we immediately were heading back downhill into the woods. 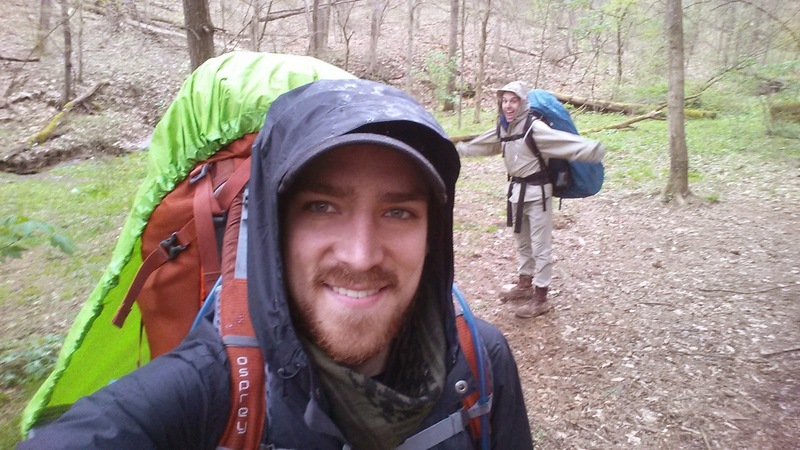 This trip was actually Kevin’s first experience with backpacking. So my plan was to take the first day very easy. We would hike in about a mile or two and find a nice camp. 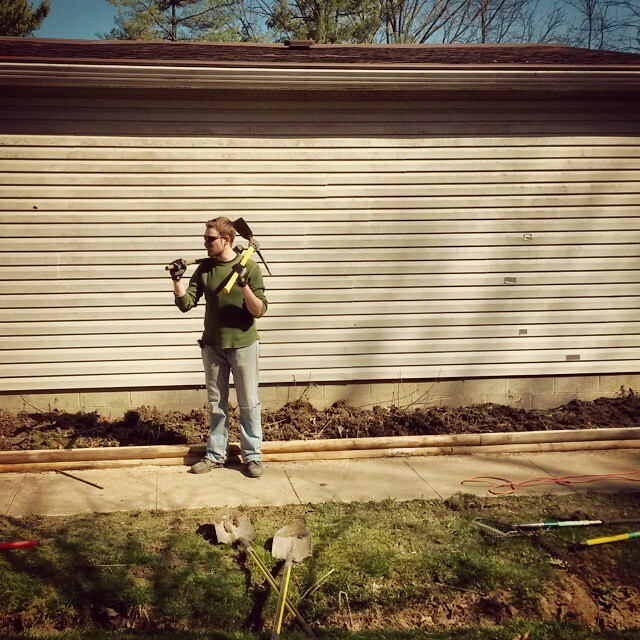 This would give us some time to setup and allow for Kevin to learn the basics of camp and my equipment. 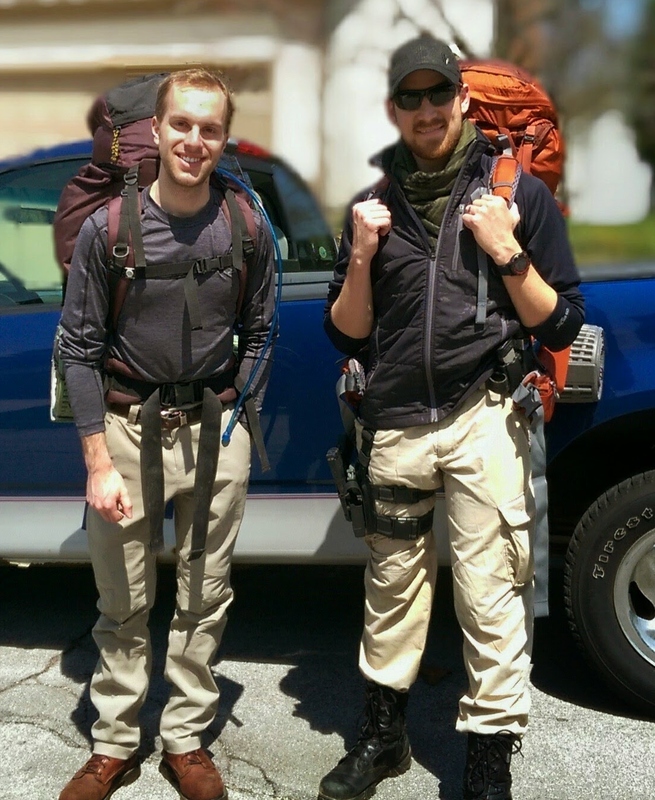 The fact that both of our packs weighed in at over 50 pounds also influenced the decision to take the first day a little easy. 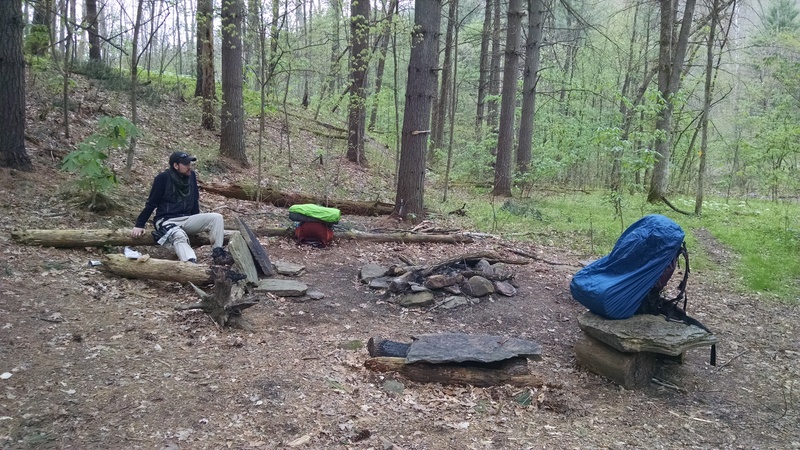 There were a couple dayhikers heading back to the trailhead, but it looked like we would be the only backpackers in the woods tonight (unless more were to arrive later). Since this was actually my second time on the trail, I decided to hike the loop in the opposite direction that I had hiked it previously. We kept a good pace and quickly arrived at the first site to see: a natural bridge that had been formed by a waterfall flowing through the weaker portions of the rock. It was a fascinating site to see and we explored the area for a few minutes. Mayflowers covered the hill and surrounding areas and the setting sun gave everything a beautiful glow. 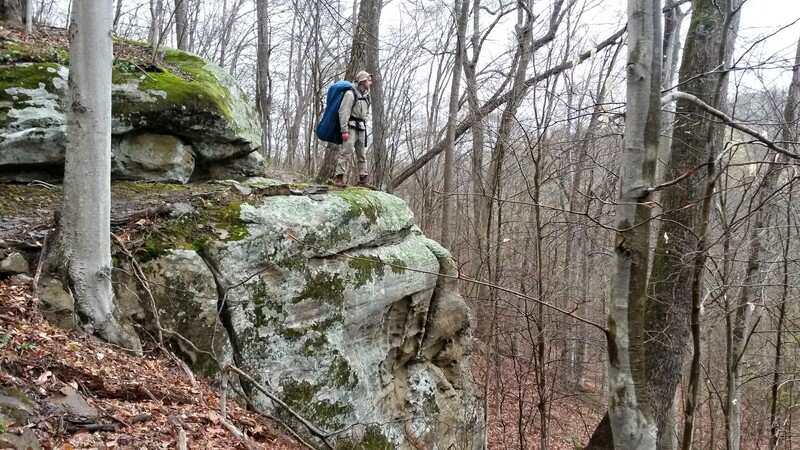 We set back out on the trail and headed through some large rock formations. 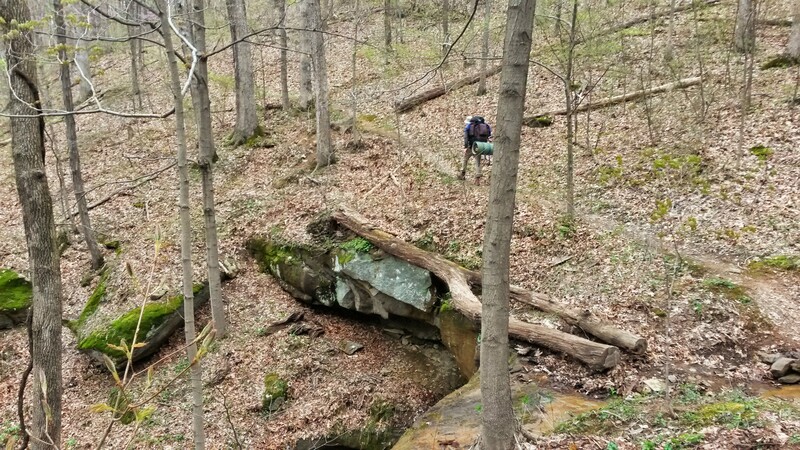 We continued to keep a good pace and covered a little under a mile from the Natural Bridge before we found our first potential campsite. The sun was still shining and the site was not cleared very well. So we decided to press on. 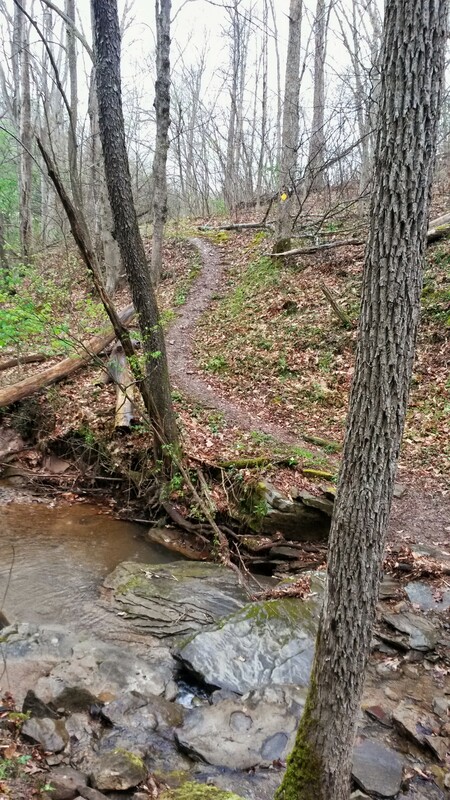 The trail wound down the large hill we were on and eventually crossed a stream. 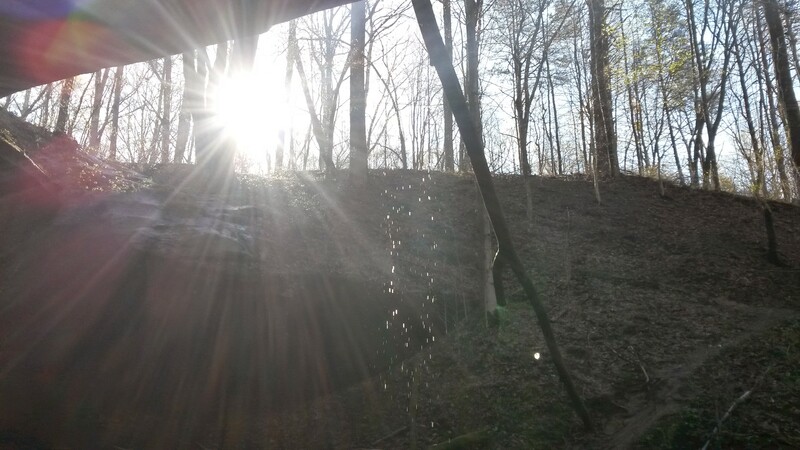 There was an old, abandoned shed and pumping station along the creek that we quickly explored before moving on. The trail twisted up a slight slope about ten feet above the creek bed and then followed parallel to the creek into a pine forest. Shortly after passing into the pine forest, we found an excellent campsite. 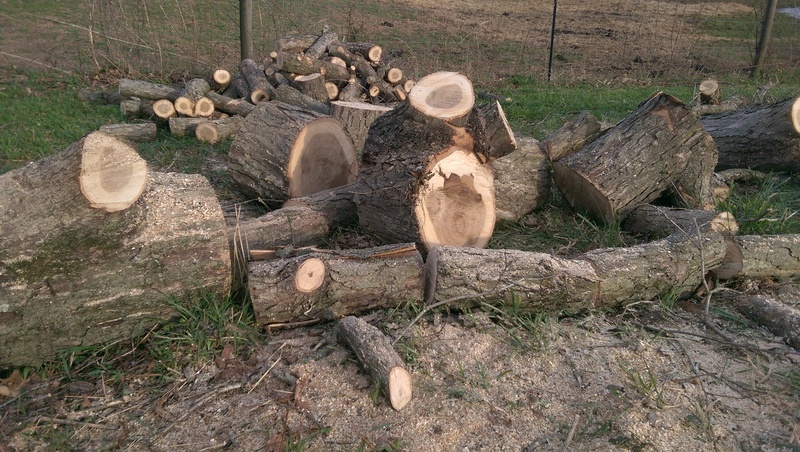 It was already cleared and had some rocks that formed a firepit as well as a few pieces of firewood. 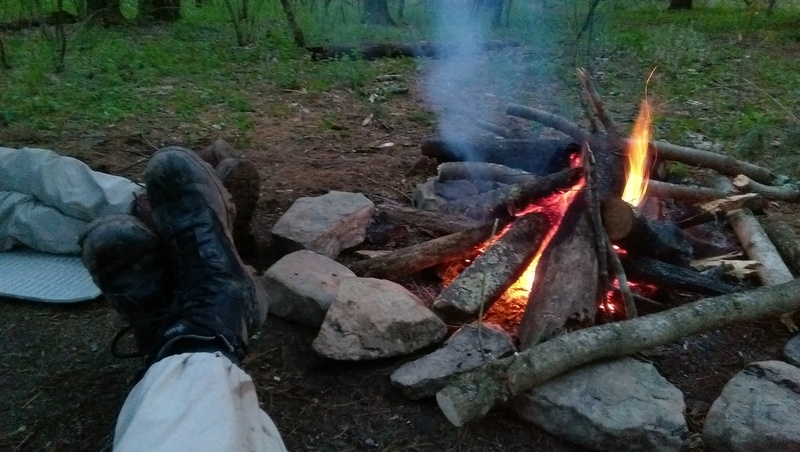 It was close to 7:30pm so we decided to camp there for the night. It was a cool evening with almost no wind as I taught Kevin how to setup our backpacking tent. 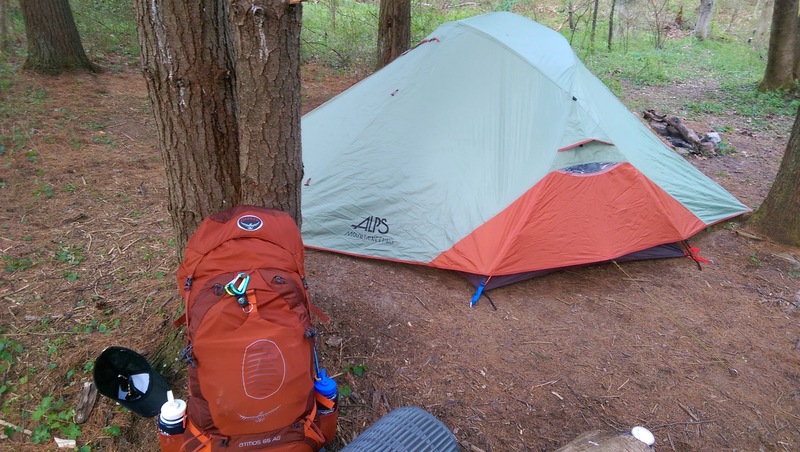 It had been a couple years since I had used this specific tent and it was a different setup than my others. Even I had to think for a few minutes to remind myself how to set it up. 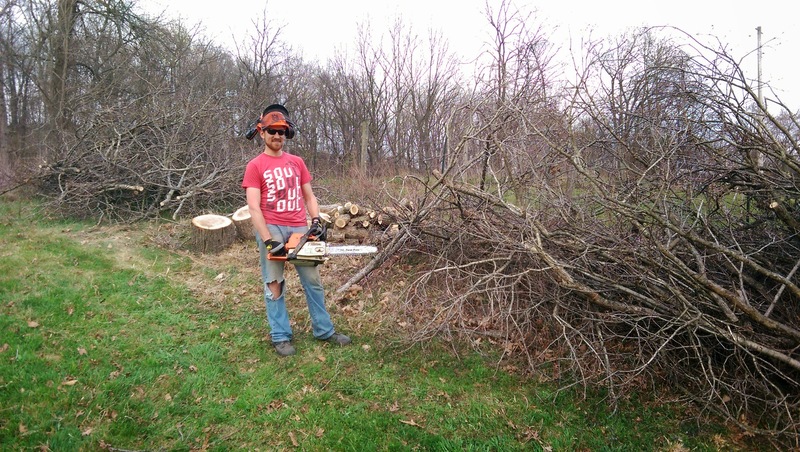 We finished that up and I started building a fire as Kevin scavenged for additional firewood. 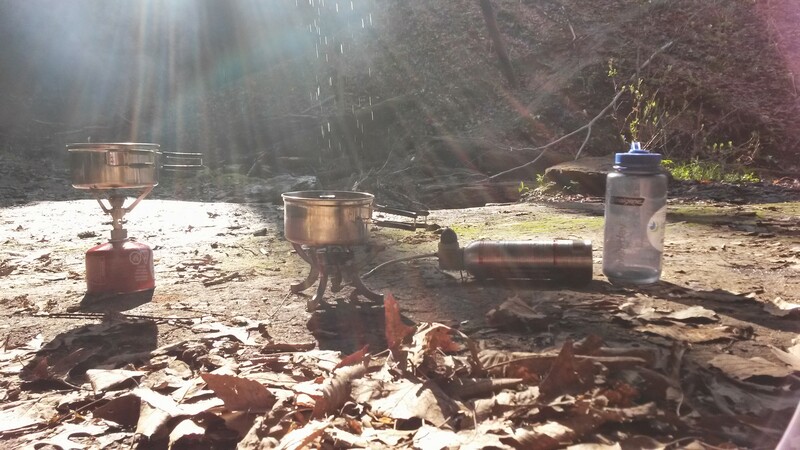 Soon, a beautiful fire was roaring and we unpacked our backpacking stove to boil some water for dinner. Our delicious freeze-dried meals consisted of Mesquite BBQ chicken and a lamb vindaloo. Both were delicious for freeze-dried trail meals. 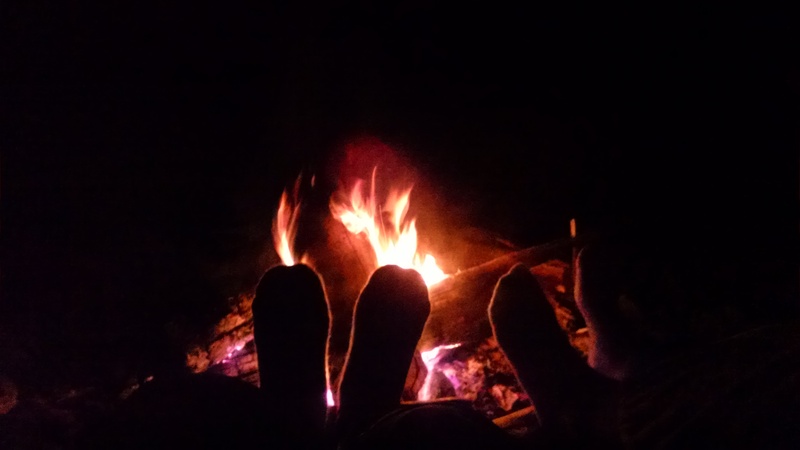 Kevin and I sat around the fire on our camp mats relaxing and letting our meals settle. With absolutely no social pressure, no worries, and no further responsibilities for the night, we were able to completely let loose and talk about anything and everything. Before we knew it, my watch showed 1am. 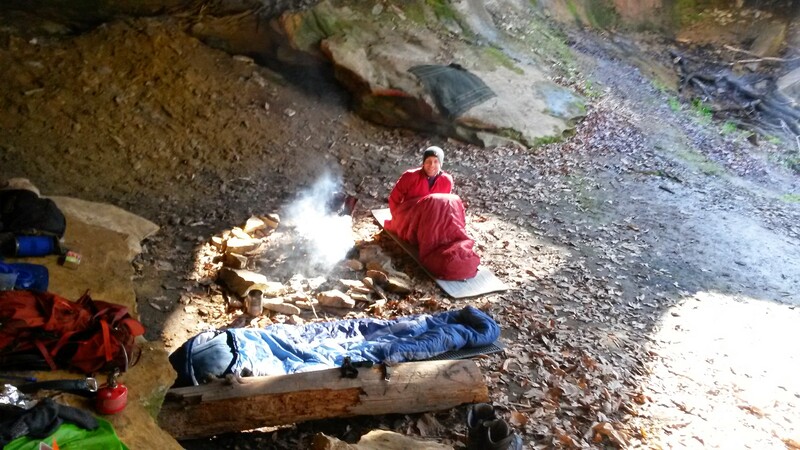 We turned in for the night and quickly fell asleep as temperatures plunged into the 20s. 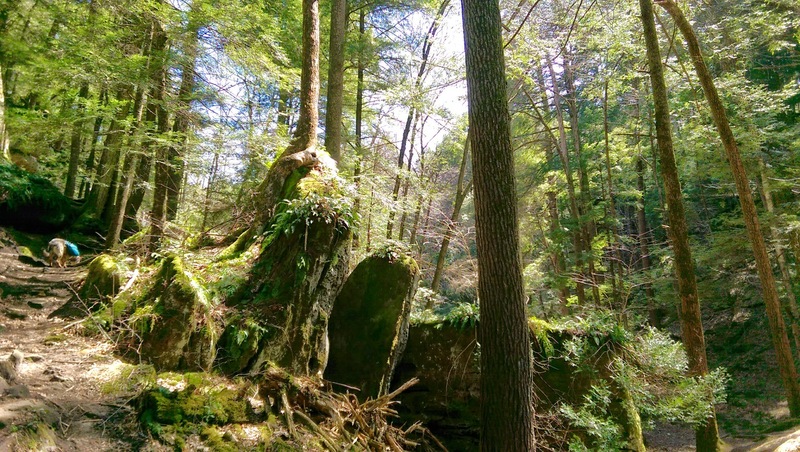 Named after a shortened version of the Hockhocking River, Hocking Hills is a spectacular outdoors experience. 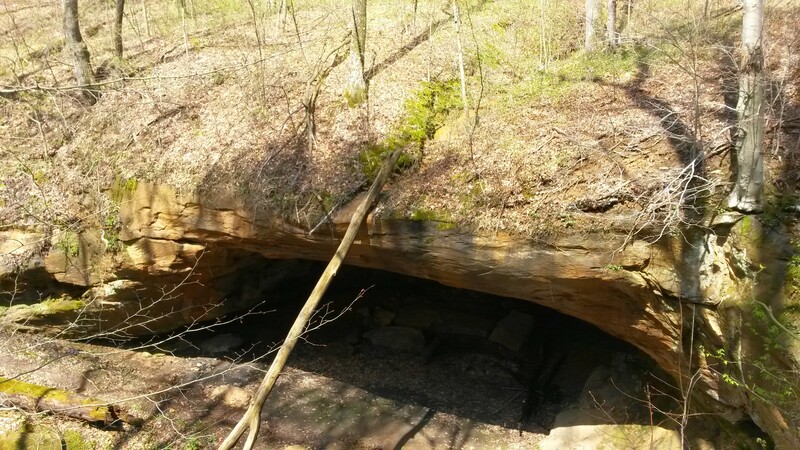 The State Park is located in Southern Ohio near Logan (in between Chillicothe and Athens). 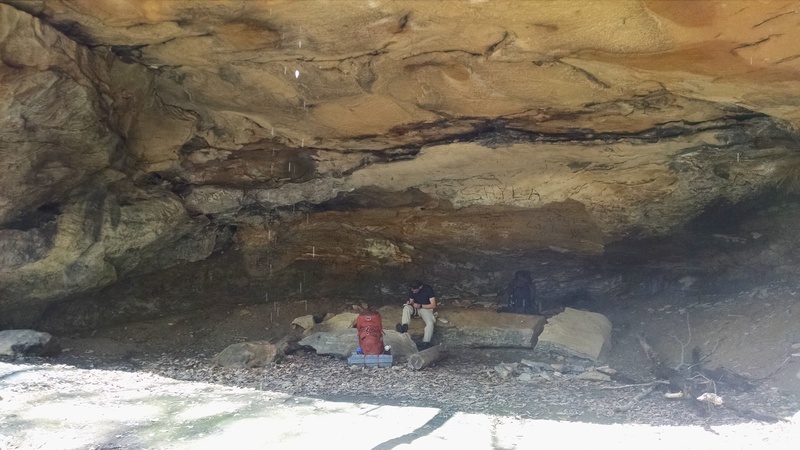 The park consists of five primary areas Old Man’s Cave, Ash Cave, Cedar Falls, Rockhouse, and Cantwell Cliffs, as well as Conkle’s Hollow, a Nature Preserve. 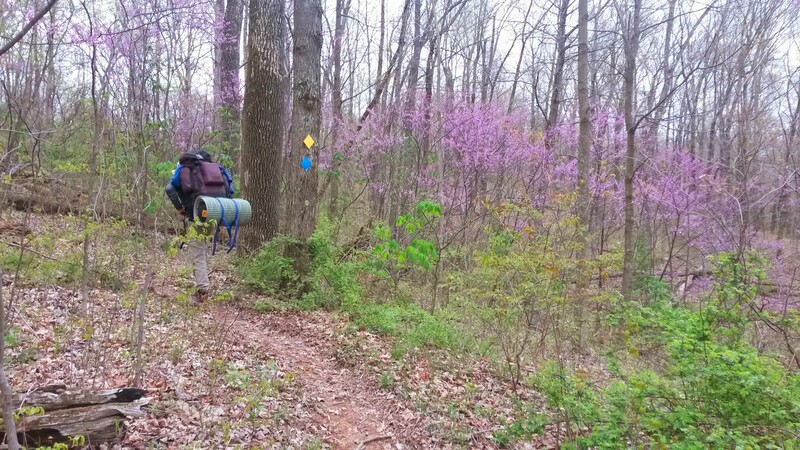 The trails are extremely well-kept, well-marked, and well-traveled. There is parking near each area and the main attractions can all be viewed with just a short hike. These trails can be completed by those of any skill level. For hikers looking for more of a challenge, many of the trails can be linked together to form longer, loop hikes. 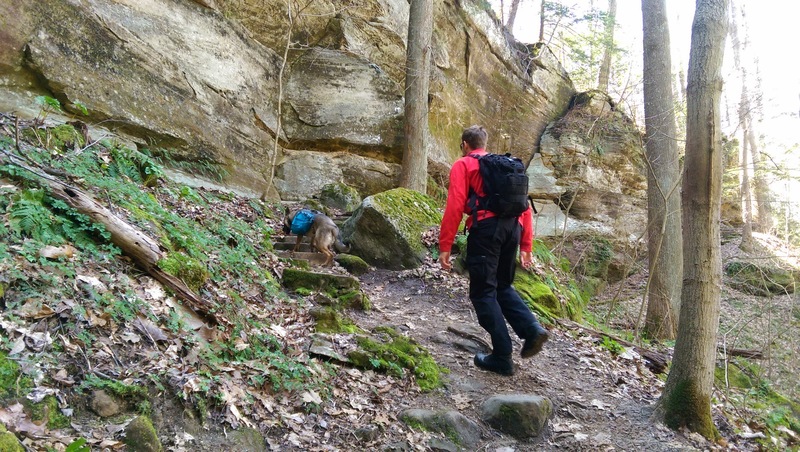 I spent three days hiking all of the major trails in Hocking Hills. Sure, it could have been done in much less time, but I enjoyed taking in the sites, taking long breaks on the trail, and soaking up the sun on some of the nicest days so far this year. It was a leisurely vacation in which we stayed in a modern cabin rather than a tent. A trip to Middle Earth? 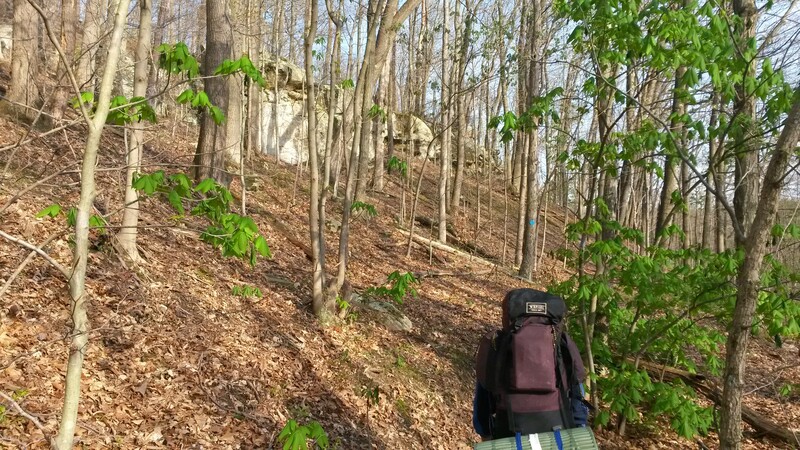 I carried a small day pack (loaded with far more gear, water, and snacks than necessary, per my usual style). The trails are typically not strenuous although there can be a lot of elevation change, roots, and rocks along the way. We had quite a bit of rain in the weeks leading up to the trip which made the paths pretty muddy, but it also made the creeks and waterfalls spectacular. My dog, Ruby, absolutely loved the trails. She can typically be somewhat prissy with water, but was so excited on the trail that she happily charged right through the mud puddles and creeks. I’m convinced she walked twice as many miles as I did, because she kept going on ahead and then coming back to see what was taking me so long; essentially walking each segment of the trail twice. 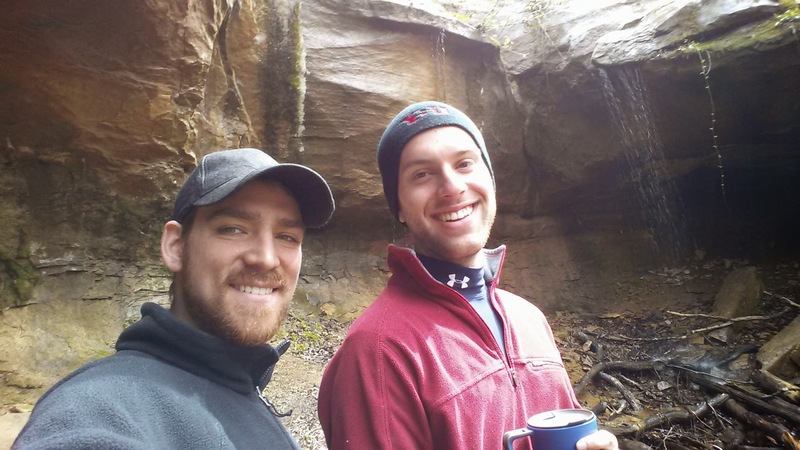 My favorite hike of the trip was a 6.2 mile loop that we did. 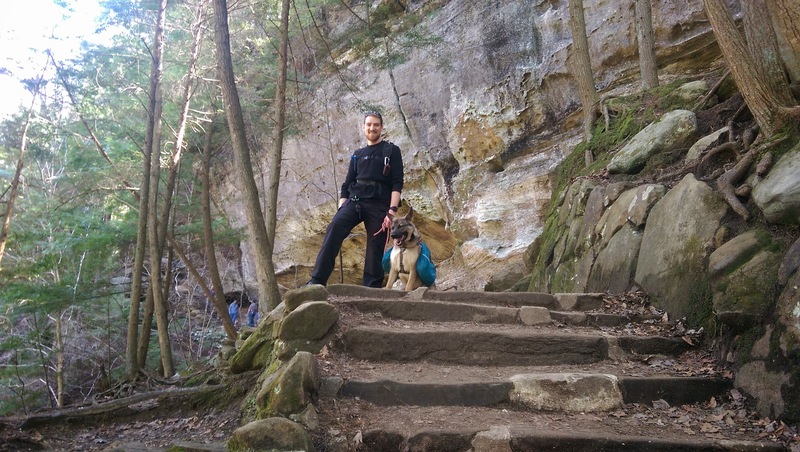 We started at Old Man’s Cave then headed down into the gorge and followed the path to Cedar Falls. From there, we climbed stairs out of the gorge and crossed a suspension bridge (that Ruby was not fond of at all) to a rim trail above the gorge. 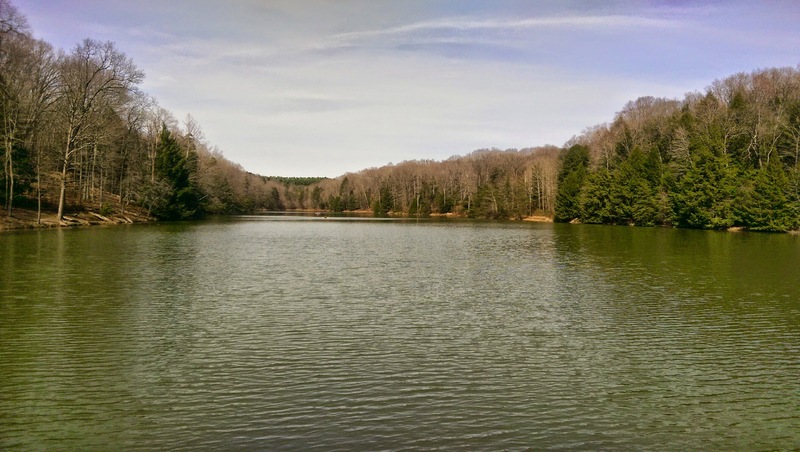 This trail winds around the gorge until it comes to Rose Lake, a beautiful lake with boating, fishing, and additional hiking trails. 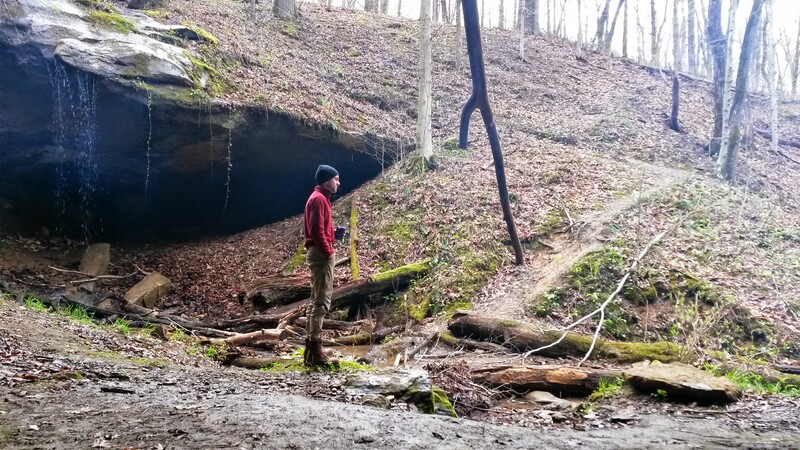 It then returns to the visitor center at Old Man’s Cave. I had a wonderful trip and was blessed with amazing weather. There is no other way to say it, if you have never been to Hocking Hills, you need to go. 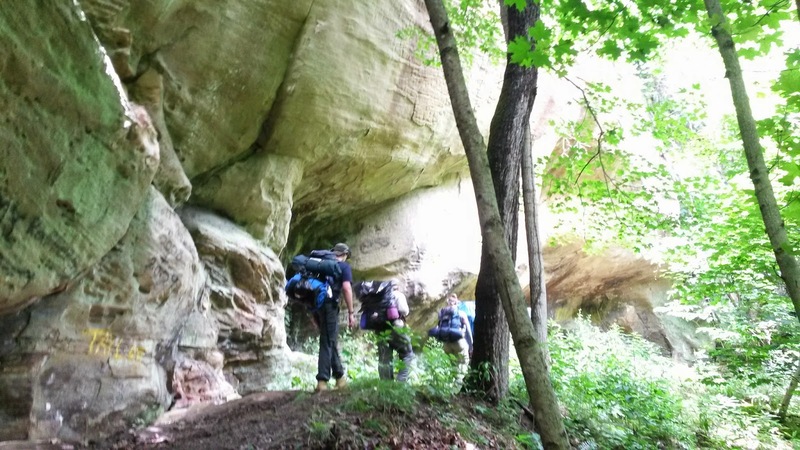 It is a great experience and some of the most beautiful scenery that Ohio has to offer. It’s close enough for a day trip from most places in Ohio. If you do plan to stay, there are plenty of great accommodations whether you prefer a lodge, a cabin, or camping. So get out and have your own adventure!